To stay competitive, Whitford Corporation wanted to continue their efforts to go mobile with the help of Dynamic Digital Advertising (DDA). After completing Whitford's Mobile Housewares Website, DDA was tasked with developing a mobile application based on this website for smartphone platforms, such as Apple®'s iOS and Android®. DDA proposed to develop the app so that it would scale up to accommodate larger screen sizes, such as tablets like the iPad®. The challenge was to translate the same seamless usability and comprehensive information as found on the Mobile Housewares Website to an application made available in the mobile marketplace. One of Whitford's requests was to configure the mobile app so that if an Internet connection is available to the mobile user, the mobile application would check the live website for any updates. 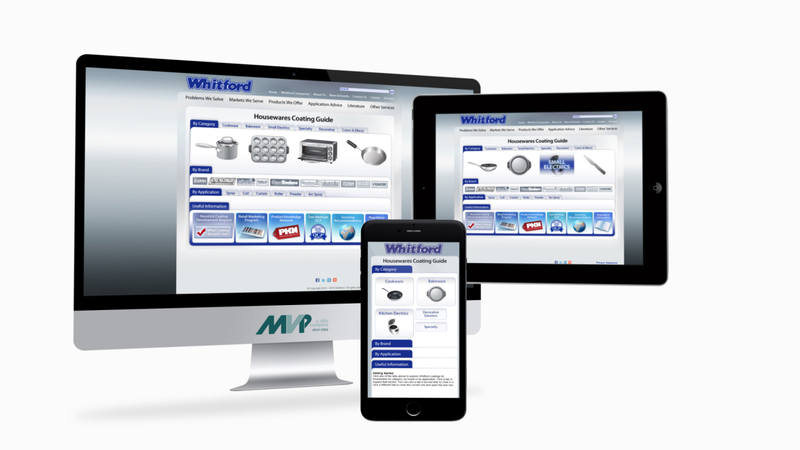 Whitford routinely updates their website with new and replacement information as products change or evolve, so it was important to them that the mobile user be privy to the most current information possible. Another objective set forth by Whitford was to track usage of the mobile application in order to determine if the app was getting enough traction to warrant a return on investment. DDA designed and programmed a hybrid mobile application for both iOS and Android platforms to duplicate the functionality found in the Whitford Mobile Housewares Website. DDA used HTML files (with changes for scaling) and configured them to display in an offline application. DDA designed the app so that users can opt to update, and then the application downloads the most recent files to the mobile device for display. DDA implemented analytics and reporting features, giving Whitford the opportunity to track and decipher usage. To distinguish this hybrid app in the iOS and Android marketplaces, DDA designed an eye-catching graphic app icon that exemplified Whitford's products in action. Today, this hybrid app is available for download, providing mobile users with product comparisons, newsletters, and specification information while on the go or in the field. Mobile users with an Internet connection are assured of the latest information anytime and anywhere. DDA is proud to help Whitford Corporation go mobile, stay competitive, and maintain its position as makers of the world's largest, most complete line of fluropolymer coatings.